In April's Labour Force Survey, Statistics Canada reported 2,100 jobs were lost across the country last month. Economists were expecting a gain of 1,000 positions. Canada's unemployment rate remains unchanged at 7.1%. 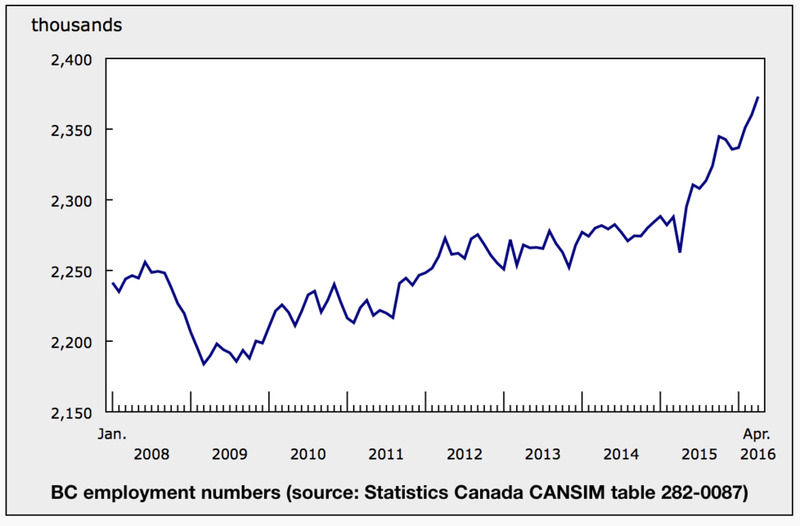 Employment in Alberta declined by 21,000 positions in April. Despite the heavy losses, the province's unemployment rate ticked up slightly to 7.2% (up form 7.1% last month) due to more people exiting the labour market. For the past 12 months, employment in the province is down 37,000 (-1.6%) while the unemployment rate is up 1.6 percentage points. Alberta's labour participation rate is down 1.1% year-over-year while the population saw a 1.6% increase, which remains the highest growth rate in Canada. Alberta's 21,000 job losses in April completely erase the March estimates of 19,000 jobs gained in the province. Employment in BC rose by 13,000, dropping the province's unemployment rate to 5.8%, now the lowest in Canada. BC jobs are focused in the retail, health care and construction sectors. This is the first time BC's unemployment rate is the lowest in Canada since 1976. On a year-over-year basis, employment in the province is up 110,000 positions (+4.9%). Newfoundland and Labrador added 6,100 jobs in April, bringing their unemployment rate down to 12.5%. Quebec and Ontario were unchanged. Manufacturing continues to be the worst performing sector, particularly manufacturing in Alberta which was primarily focused around the energy patch. Alberta lost 52,000 manufacturing jobs last year but that number seems to be levelling off. The natural resources sector continues to shed jobs, although at a slower pace. The sector lost 7,800 more jobs in April, bring the total losses to 23,000 year-over-year. Most of those jobs were lost in Alberta. Economists expects a short term spike in Alberta's unemployment numbers due to the many small business adversely affected by the Fort McMurray forest fires. The May Canadian labour data will be released June 10th. US employment numbers came in at 160,000, lower than the 205,000 job gains expected. The US jobless rate held steady at 5%. Average hourly wages rose 2.5%, better than expected. Participation declined to 62.8% but gains were made in the number of hours worked. US jobs appear to be shifting from lower wage sectors such as retail and accommodations into higher paying jobs, such as professional, financial services and health care. Employment trends in Canada are the reverse, moving from higher paying to lower paying sectors of the economy. Note that US and Canadian employment data is calculated differently. The US Department of Labor excludes youth unemployment, which tends to be very high. Using US metrics, the Canadian unemployment rate would be 6.1%.